The previous "M.I.A. Hunter" titles by house name Jack Buchanan were written by Stephen Mertz and Mike Newton. The share ration between the two is anyone's guess. 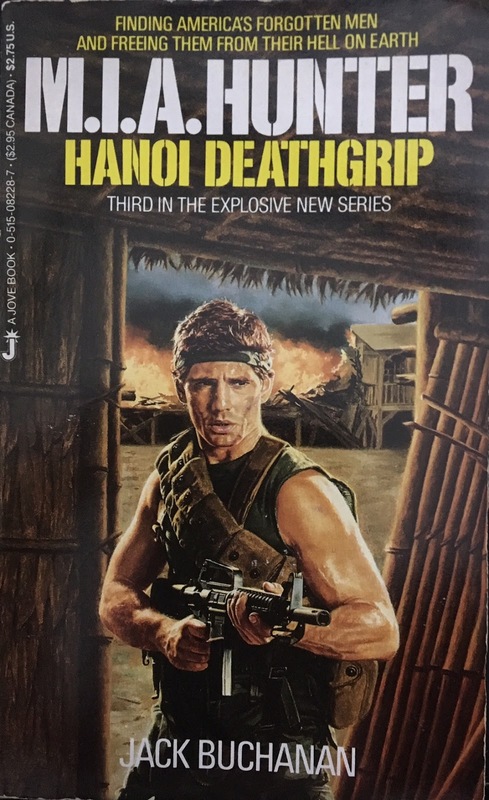 However, with book three, "Hanoi Deathgrip", the talented journeyman Joe Lansdale ("Batman", "Jonah Hex") steps up. Newton/Mertz were great. Lansdale is awesome. We start where any action tale worth it's salt begins - a brothel. Texan Hog Wiley is throwing bodies out of windows and tearing up the cathouse like a rat on a cheeto. Luckily, Terrance Louglin and Mark Stone arrive to grag Hog and head out for another jungle excursion. But first, we get an obligatory flashback from the author. Combat reporter Jackie Winslow shows up looking like an 80's Kathleen Turner. She's at Mark Stone's private eye firm to beg for his assistance in rescuing her father from Vietnam. Major/Dr. Winslow was captured doing some volunteer medical work in Laos. Stone and Winslow have a little attraction that Stone dismisses later. Anyhoo, Stone finds that the ISA has targeted his home and attempted to steal a bunch of his files. He turns over a van and gets them all back in an early scene. The three main characters do the normal song and dance of the series. They meet with some freedom fighters to thicken up the gun-soup and head into the jungle for the rescue. In the meantime, Lansdale introduces us to the captive Winslow and some other Americans that are being held at the prison camp. Winslow is getting brutalized by the cruel camp commander Po. This guy is pretty much the cookie-cutter of the prior series' commander villains. Lansdale does descriptive work with more gritty, albeit grizzly, details than his predecessors. The harsh treatment is depicted with no holds barred. The snake scene left me disgusted to say the least. Our non-profit heroes are meeting by the river to scrape on some black goo and waterpoof the goods. There they find that Jackie has joined them in full fatigues and combat get-up. She's ready for a fight. Hog loses his temper and refuses to fight side by side with a woman. But once Jackie proves she can shoot straight and ride a horse Hog is fine with it. Fast forward past the near drowning, the snake viper fight (second book in a row that has Stone vs Snake by the way) and we are in the middle of a Jean Claude Van-Damne tournament fighter movie. Po's brother is a fat brute named Tho. Turns out Tho likes to duke it out and squash people half his size. Po has a giant battleground pit inside the camp and throws prisoners in for Tho to digest. Tho kills off three guys at once, which proves that a Hog vs Tho contest is surely coming. But before that, Winslow knows that he is the next food for Tho's ghastly combat diet. He wants to break out on the same night Stone wants to break in. Winslow's break-out attempt is quickly squashed by Po and the two square off in a deadly torture session. Before Winslow expires Stone blows the gate off and our boys and girl are ready to gun it up. The group lights up the M-60 guard towers and soon this book comes down to the meat and potatoes. Hog vs Tho, strong man vs strong man. As the whole camp comes under fire, the two have a epic battle. How do they get back to the US? Where does Winslow go? Can he get back into the country? These are all excellent questions that the 'M.I.A. Hunter' series never has really time to answer. End result? Lansdale creates a gritty and uber-violent tale that shows Stone doing what he does best. Shooting snakes and Cong with CAR-15s. That's what we came for, right? 'M.I.A. Hunter' is built on these types of stories and "Hanoi Deathgrip" fits right in. It has a little bit of everything albeit a bit predictable and dated looking back. Lansdale returns again to the series in future books.